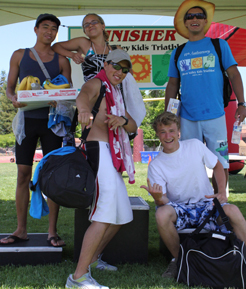 Lifeguards trained at De Anza College volunteered at the Silicon Valley Kid’s Triathlon, June 6, 2010, as they have since 2004. The race, run by the Silicon Valley Triathlon Club, is a fundraiser for the Silicon Valley Children’s Fund, which benefits local foster children. 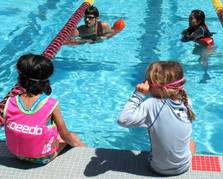 The lifeguards set up the pool at 6 a.m.
1,000 kids ages 15 to about 3 swam in 22 waves (groups) starting at 8 a.m. with the last wave at 11:15. 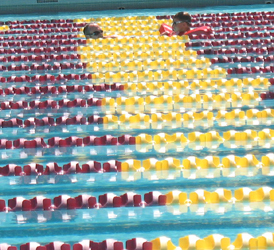 The oldest swam 200 yards, most swam 100 yards and the youngest swam 25 yards (across the width of the De Anza olympic sized pool). 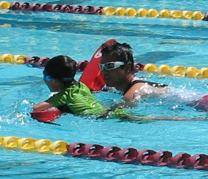 Occasionally a swimmer either waved for help or grabbed a lane line and a lifeguard went in to assist. 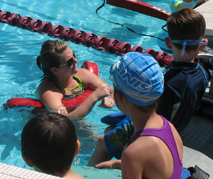 Most of the lifeguards get in the water with the last four waves of swimmers, ages six and under. 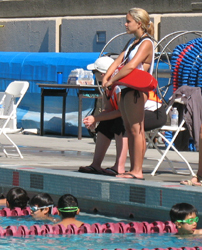 Red Cross lifeguard and lifeguard instructor: Alan Ahlstrand, Paul Barron, Mary Donahue, Ken Mignosa and Quang Tran (who is also an EMT). 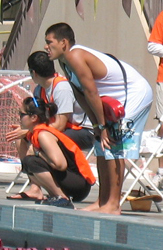 Red Cross lifeguards: Herland Antezana, Jeremiah Chua, Emily May, Bernadette Milan, Brittany Peters, Javier Puente, Susan Restani and Ethan Wilkie. Debbie Adams (who is also a Red Cross CPR instructor and in the De Anza nursing program), Joelle Cope, Cody Graef, Alanna Klausen, Joyce Kuo and Joe Lloyd.